Information about the topics below is available as pdf-files. Is ist too cold to ride when temperatures are below -40°C (-40°F)? Air temperatures below -20°C (-28°F) force you to wear a neoprene mask to prevent damages to your lung. Below -40°C the water vapor you exhale would freeze immediately on and in this mask. Then you will not get enough air for breathing while riding. You have to go slowly then. Your must-have cold-weather clothing includes what? b) Apply the so called "onion principle": several layers of clothing with different functions to staying dry and to be insulated against cold, wind and snow (see question 4). With this principle you can quickly and easily adapt the number of layers to the outside situation and your activity (= degree of sweating). c) Be aware that only your legs, but not your feet are being moved and kept warm on a pedal. A cycling boot for cold conditions should have excellent insulation and also a more or less soft sole. Your must-have cold-weather equipment includes what (if anything)? a) Therm-a-rest mat, b) down sleeping bag (e.g. Mountain Equipment, The North Face) with a comfort range 10° below the average temperature you would expect on your trip. If using a down sleeping bag, you need a Waterproof nylon inlet for your sleeping bag (The North Face) to keep the functionality and loft of the sleeping bag. c) high quality stove for cocking your food (e.g. MSR XKG, MSR Dragonfly, Primus Multifuel EX, Primus Etapower), d) white gas or aircraft kerosene for this stove. What's the warmest piece of cycling clothing you own? Below -20°C there are no specific cycling clothes on the market. 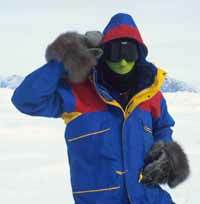 You have to use the clothing designed for polar expeditions. If you apply the principle of the several layers of clothing there is no "warmest piece" of clothing. These layers are: underwear of polypropylene / fleece sweater or fleece light jacket of 100fleece / fleece warm jacket of 300fleece / polar jacket against wind and snow (below -20°C GoreTex is not necessary) / down jacket when resting to keep warm. Very important: warm gloves. I'm using gloves for polar workers on oil platforms of North Canada. First Winter Mountainbike Expedition in Nothwest Greenland (Feb. - May 1992) together with a friend (Gottfried Debove). Three months cycling on the frozen sea along the coastline from Upernavik region to Uummannaq region. Completely self planned and self preparied. Realization without supply of local infrastructure (except helicopters). Temperatures of minus 47°C (February) to minus 10°C (May). Sleeping in a tent. Eating special diet of 5500 kcal per day. Great landscapes / many contacts to very friendly Greenlandic Inuits / wide range of new experiences and knowledge about cycling and behavior in cold weather, and the helpful equipment for such a trip / many new ideas about other bicycle trips on ice and under cold conditions. I think: just do it! Nothing is impossible if not tried out before! But be careful that you do not approach your physical and psychical limits too fast. Everybody needs time for learning and understanding the situation when cycling in cold weather. Don't start with a cycling tour crossing Greenland's ice. Best bicycle equipment for cycling in cold weather? Rohloff's 14-gear Speedhub because snow and ice would paste and stick together the individual parts of a traditional derailleur system. Lamb coat or fur on the saddle. When cycling for several weeks: BOB trailer for storing the big parts of your equipment (tent, mat, sleeping bag) or some of the food for burning calories against the cold. Greenland still is part of Denmark. 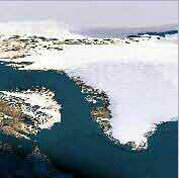 However, on May 1st, 1979 Greenland became a separate state within the kingdom of Denmark. Since then, the inhabitants of Greenland have the right to take care of their internal affairs. The educational system, taxes, social system, transport and trade has changed a lot since then. Since May 1st 1998 the inhabitants of Greenland even independently deal with their natural resources - however, the state of Denmark has a veto-right. The department of Justice, Defence, and Foreign affairs are completely represented by the state of Denmark. The most important consequence of the 20 years of independence was the growing self identity of the Inuit. The area of Greenland is 2,175,000 km². Only 16 % are free of ice, the remaining 84% are covered by a huge glacier. The 55,000 inhabitants consist of about 47,000 Inuits and 8,000 Europeans. There are regular flights to Greenland from Kevlavik (Iceland) and Copenhagen (Denmark). Copyright © 1992 Waltraud Schulze & Andy Heßberg.